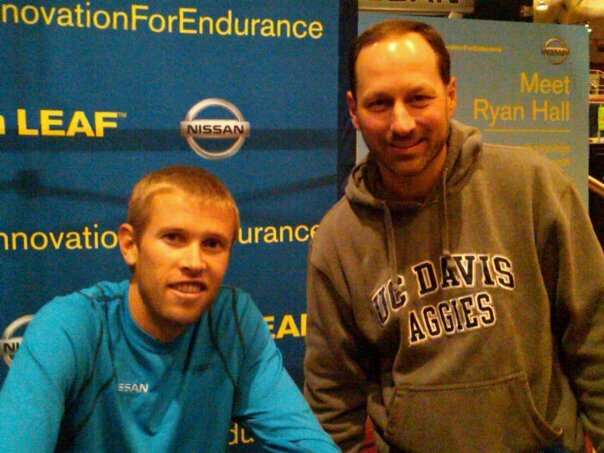 Ryan Hall is the fastest American-born marathoner of all time. He is also a committed follower of Jesus Christ. His book, Running With Joy, follows his preparation for the 2010 Boston marathon. Ryan reveals his struggles with injuries, weather and training, and how he ultimately was able to overcome them and return to the joy of running through his lifelong goal of glorifying Christ on and off the racecourse. Earlier today, at the Marine Corps Marathon pre-race expo, I had the opportunity to meet Ryan and chat for just a minute or two. His initial comment was, "UC Davis, hey, you know I live in Redding. Ever hear of Bethel Church?" A few comments about training in NorCal, and some back and forth on Jeremiah 12:5, and then he signed an autograph as he signs every one of them, Ryan Hall, John 10:10. A refreshing encounter and a seemingly all around great guy. Young runners would do well to find a role model in Ryan Hall, both on and off the racecourse. How cool that you were able to meet and speak with him. His book is on my to purchase list. Praying you have a great run and hit that PR tomorrow. Godspeed! Run blessed! Thanks Trish. Was an excellent day, more to come. Hope your running is going well. We are also getting closer to our Run For God session starting in February - very excited.